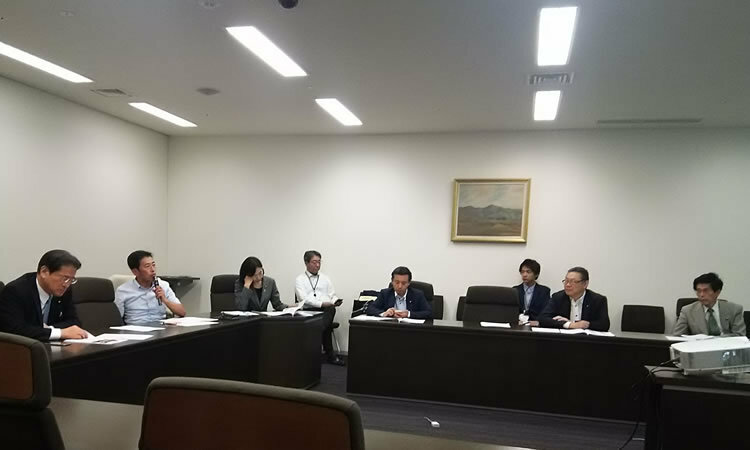 On June 14th in 2017, Katsuya Ogawa, the first Animal Welfare Study Group was held, which was called by a member of the House of Councilors and Takashi Shinohara, a member of the House of Representatives. In the beginning, Mr. Ogawa pointed out that he had raised the issue of how behind Japan was in terms of animal welfare in the diet, how the discussion with the Ministry of Agriculture, Forestry and Fisheries of Japan had not progressed, and he felt a sense of crisis that we must do something now to move forward to meet standards similar to foreign countries’, towards the Tokyo Olympics and Paralympics held in 2020. Also, he emphasized that it is wrong to think it’s ok to do anything to animals we eat since they end up getting killed anyways. He pointed out hens have been turned into egg laying machines while they would be naturally pecking the ground to pick up food 10,000 times. Hens get killed without knowing what dirt is. He emphasized to members in the meeting how important it is to open dialogues about these issues to make the country work towards animal welfare. Furthermore, Mr. Shinohra stated that animal welfare appeared to be only promoted in Europe, but Japanese people are essentially kind citizens, and hence, we should get our kindness back. There were only 6 members that attended the study group since it was only 3 days before the diet would conclude, as well as due to the difficult issues to be tackled. That said, the attendees acknowledged the agenda and its importance. The Animal Rights Center shared the current status of animal welfare in Europe, US, China, and Korea, and the current situations of agriculture in Japan, such as farms, transportation, and slaughterhouses. 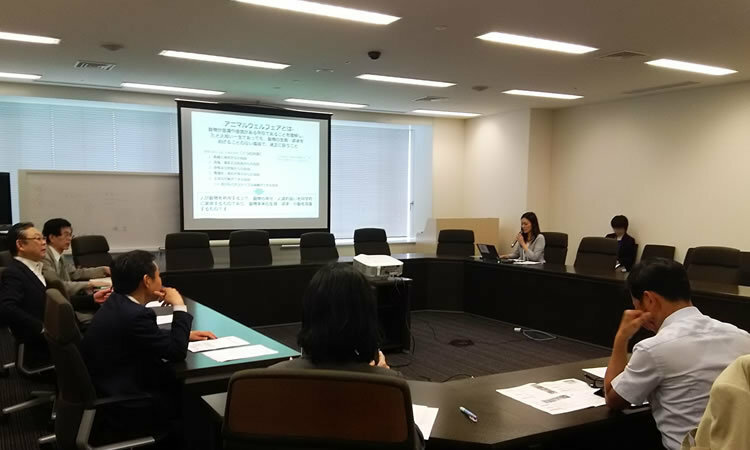 Also, Japanese’ awareness of the issues, the procurement status of livestock for the Olympics and Paralympics and its animal welfare consideration, as well as changes to the law in terms of livestock in the Act on Welfare and Management of Animals were discussed. We shared how we tackled these issues to make improvements. After sharing the agenda, there was Q&A as well as discussions. During this time, we all acknowledged that Japan has been devastated in terms of animal welfare while the EU and US have been working on these issues from perspectives of the impact on the environment and infectious diseases shared by animals and humans. We also discussed that while neighboring communities sometimes complain about the smell, it is not really a space issue in Japan, though that’s what people usually say; Japan has limited land. This is not necessarily true. However, it would cause financial damage to stop the production if moved, so there needs to be subsidies. It was also learned that there has been a carrot and stick policy in the EU to regulate certain areas while giving subsidies for farmers who do well, and there are groups specialized in animal protection, certification, producers, and academia, who all work towards animal welfare. We shall continue this study group to discuss concerned topics. As Mr. Ogawa stated, now is the time to revolutionize the practice when we have a clear set year, 2020, or it would be too late. Furthermore, we think the JGPA certified “animal welfare” getting set by the Ministry of Agriculture, Forestry and Fisheries of Japan, which only guarantees prevention of animal abuse, and consideration for animals, should be legally compulsory, since these issues are currently barely met in Japan. Many Japanese citizens don’t even think about violence occurring during production when they eat meat and eggs. Think about athletes and tourists coming to Tokyo for the event in 2020. That thought wouldn’t even cross their minds. The gap between Japan and the world will get wider and wider in animal welfare if we only guaranteed the minimum welfare. The world is changing to develop a system that cares about animal welfare at a rapid pace. We’re at a point where we can change our current systems including battery cages and gestation crates. We need to reach out to all stakeholders including consumers, producers, retailers, legislators, and politicians to suggest methods for change. There is no doubt that these members of the study group are these leaders. We shall keep working to make sure more people will emerge to take leadership roles in other areas as well. As Mr. Shinohara said, we believe Japanese citizens have grounds to care for animals, and as such; there will be even higher standards of animal welfare than those in the EU and the US in the societies future.